The uplifting scent of lemon really sets the day off right, and this complete shave kit is an ideal way to incorporate the zesty scent into your morning routine. Fight chapped lips and get an instant hit of de-stressing lemon with each and every application of this refreshing and calming balm. 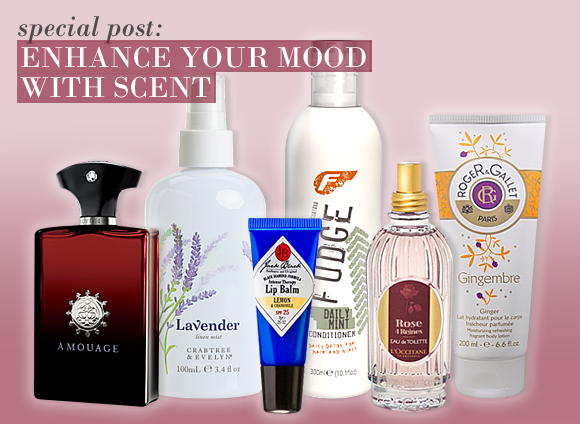 The rose has many different facets, and this scent presents a more sensual aspect of the bloom. It is striking, sensual and very confident. A more romantic rose fragrance that blends together four rose queens: the Grasse rose, the Bulgarian rose, the Moroccan rose and the Turkish rose. Refresh both your hair and your mind with this cooling formulation. You’ll feel more carefree and lighter after use! This intense conditioner is creates soft, silky, shiny hair, and infuses it with the clarifying scent of peppermint all day long. Wearing ginger in a body lotion format is an ideal way to really get the body feeling energised. Apply in vigorous massage motions for revived skin. This unisex scent can be splashed vigorously all over to release the scent of Ginger warmed by Cognac and Geranium Bourbon. Lavender is well known for its soothing and calming capabilities. Infuse your bedding with the gentle herbal scent of this Lavender Linen Mist to fully reap its benefits. Wherever you find yourself bedding down, make sure you keep this handy roller ball close to hand. Apply to pulse points for combined antiseptic and tension-relieving capabilities. I've been looking for a good lip balm for quite a long time and now I've found it. After using the balm for a week my winter chapped lips are in much better condition and I'm not experiencing the daily dryness that leads to chapping in the first place, so I think Intense Therapy is a good name. I like the squeeze tube application and the fragrance is very pleasant as it's light and not at all overpowering. One thing to note, there's a very slight tingling sensation in the way of a minor lip plumper, which is probably from the lemon. Like I say, it is very slight, so I was fine with that but it's perhaps worth bearing in mind if you have sensitive skin. This entry was posted on Tuesday, November 8th, 2011 at 11:50 am and is filed under Fragrance, Haircare, Men, Skincare. You can follow any responses to this entry through the RSS 2.0 feed. You can skip to the end and leave a response. Pinging is currently not allowed.